Turn your cane over and place the handle on the floor. Stand straight with your arms relaxed by your side and measure from the floor next to the outside center of your shoe up to the indentation of your wrist joint. Don't stiffen your arms. Let them relax naturally. This measurement is the typical total length of the cane that will fit your height, however we recommend adding one-half inch to this measurement for the proper arm bend when using your cane. 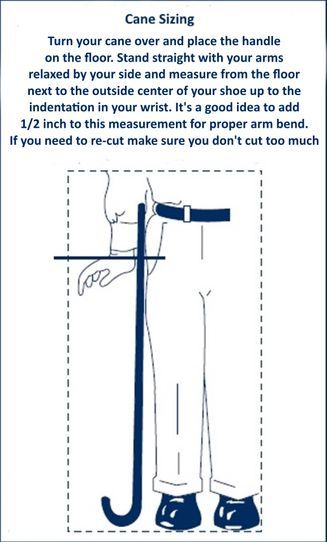 If your cane is still too long after the first cut, simply make another cut to lower it until it is comfortable for you. Just a slight arm bend is desirable while using and walking with your cane. Too much arm bend is ineffective as well as too little arm bend. We do not cut canes to length. The aluminum cane can be cut to your preferred length. The aluminum cane is very easy to cut with a metal cutting saw such as a hack saw. Make sure your cut is square so the end fits flush into the rubber tip. Smooth any sharp edges with a file. Only cut the tip end and not the handle end. Do not use aluminum polish on the black finished canes. Do not use any type of high speed polishing tool such as a Dremmel Tool or an electronic buffer on your cane. The aluminum canes have a high quality, clear, hard coat or black anodized finish applied. Applying pressure with a high speed polishing tool can remove the anodized finish or distort the finish. Use only a soft cloth to wipe your cane.